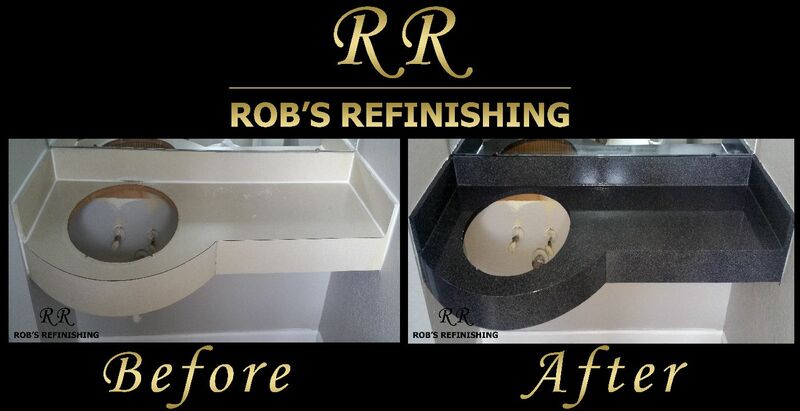 Rob's Refinishing is the best choice for restoring the beauty in your bathtub, tile, and countertops. We offer high-quality work, outstanding customer service, and a superb quality service guarantee. 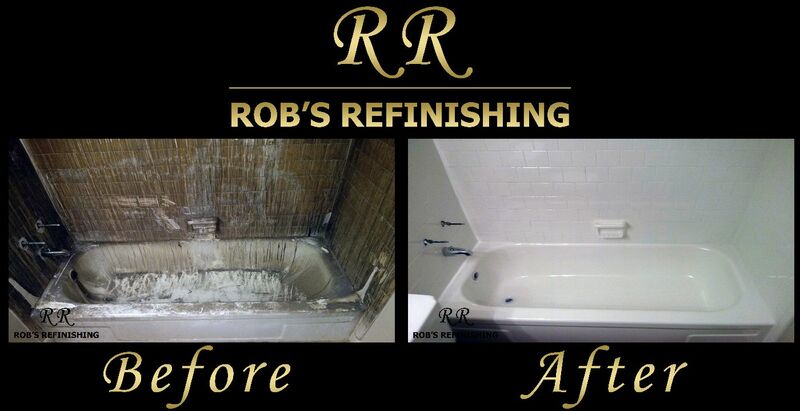 We are experts at refinishing surfaces such as: Bathtubs, Tile, Fiberglass, Countertops, Crack Repairs, and more! Before you spend thousands to replace your bathroom, consider the value of refinishing. Refinishing is a practical method to make tired and worn fixtures look new at a fraction of the cost of replacement. With little impact on your busy life, we'll professionally prep and refinish your bathtub, tile, or countertop to a new, high-gloss shine. The result is a fixture that has amazing gloss and durability. Finish: Fiberglass, Porcelain, Cast Iron, Acrylic, etc. Types: Standard, Claw-Foot, Whirlpool, etc. Issues: Chips, Color, Cracks, Dents, Rust, etc. Refinishing your bathtub is the most economical and efficient way to revitalize your bathroom, at a mere fraction of the cost of replacement. Fixture replacement involves not only the cost of new fixtures, but also replacing the wall, tile, wallboard, tile floor and subfloor, plus pipes and hardware which are damaged during the removal of the tub. This is very time consuming and expensive! Refinishing will allow you to realize spectacular savings, often as much as 90% versus the cost of replacement! Stained, chipped, and hard-to-keep clean bathroom fixtures are unsightly and unhealthy, and can create a negative impression to your guests. Refinishing your bathroom fixtures will give them a smooth, glossy finish within a matter of hours. This non-porous finish actually meets and exceeds the original manufacturer's specifications for stain and acid resistance. The refinishing process is a remarkable, time-tested method that was developed specifically for bathtub and tiled wall finishing. The secret lies in the ability of the compounds to fuse themselves into the original surface through a molecular bonding action. The new finish becomes a permanent part of the existing fixture, unlike bathtub liners, which can crack, trapping unsanitary water. Finish: Laminate, Cultured Marble, Porcelain, etc. Types: Bathrooms, Kitchens, Vanities, etc. Issues: Burns, Chips, Color, Cracks, Dents, etc. When damage is scattered over the countertop, the finish is worn, or a color change is desired, it is more economical and efficient to refinish the countertop. Existing laminate and ceramic tile countertops can be refinished in a matter of hours without the mess of a replacement job and at significant cost savings when compared to replacement. The longevity of the refinished countertop should be the equivalent or exceed that of the original countertop. Both gloss and satin finishes are available in a variety of options including a variety of solid and speckled colors and now a revolutionary stone finish.